On the 26h of May Holland officially announced their finalised squad for Euro 2012. Regular names such as John Heitinga, captain Mark Van Bommel, Wesley Sneijder, Arjen Robben and an in form Robin Van Persie were all included by head coach Bert Van Marwijk; however the 60 year old did spring a few surprises in his 23 man squad. The duo of 18 year old wing back, Jetro Willems and 21 year old winger Luciano Narsingh will join up with a lengthy list of experienced players for this summer’s European Championship; both players are highly rated individuals who currently ply their trade in Holland’s Eredivisie. Holland face a difficult task as they have been pitted in this years “Group of Death” alongside an extremely dangerous Germany side, a Portugal side who are still capable of being a threat, while Morten Olsen’s Denmark make up the tricky group. The Oranje have a point to prove, after being beaten by Spain in the 2010 World Cup final, in a well and truly heated affair, but can the following list of players manage to overcome a demanding test of will and strength and claim the European trophy for a second time? 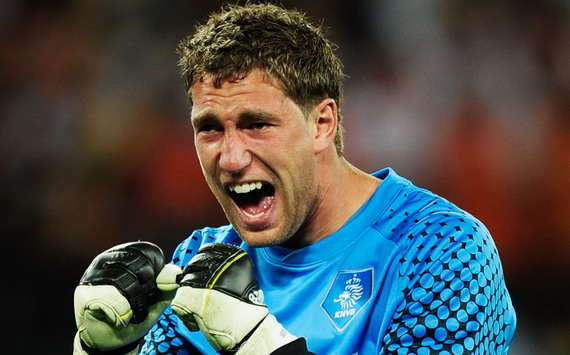 1)Maarten Stekelenburg – Stekelenburg will mostly likely be Holland’s number one choice goalkeeper for this summer’s European Championships, standing at 6ft5 the 29 year old is a massive presence between the sticks for Van Marwijk’s side. Along with Manuel Neuer and Spain’s Iker Casillas, neutral fans should expect to see a number of quality performances from Stekelenburg this summer. 12)Michel Vorm – Vorm was undoubtedly one of the buys of the 2011/2012 English Premier League season. Vorm produced plenty of quality performances for Swansea, some of which were match winning to say the least. In a few years’ time, Dutch fans should expect to see a battle between Vorm and Newcastle goalkeeper Tim Krul(see below), for the right to wear Holland’s number one jersey. 22)Tim Krul – Tim Krul fully deserves to be a part of Holland’s Euro 2012 squad, after having an exceptional season for Newcastle United. Krul is one of Holland’s most exciting prospects, for a goalkeeper Krul has accomplished himself to be one of the Premier League’s finest stoppers; expect to see him push Stekelenburg for the Dutch number one jersey in a few years’ time. 2)Gregory Van Der Wiel – Van Der Wiel is currently one of the most talked about full backs in World Football, only 24 years of age the Ajax prodigy is one of Holland’s most highly rated talents. Van Der Wiel who is an attacking right-back, could well make a major breakthrough this summer, he could well face a few difficult tasks, but the Dutch fans will be hoping he is more than capable of doing a stable job in the Holland back four. 3)John Heitinga – The strong and reliant John Heitinga is a crucial part to the Dutch side, Heitinga comes into Euro 2012 on the back of a fantastic season for his club side Everton. Heitinga claimed the Supporters Player Of The Season Award for his reliable performances for the Toffees; many fans expect to see him perform for Holland at this year’s European Championships. 4)Joris Mathijsen – Questions have been raised this season, on the performances and fitness of Malaga centre back Joris Mathijsen. The 32 year old hasn’t shown the best of form in 2012, but when playing for Holland, Mathijsen often proves his class when partnering Heitinga in the centre of defence. A lot depends on the performances of both centre backs, but all eyes will be on Mathijsen’s form because drastic improvement is needed. 5)Wilfred Bouma – Bouma will be the oldest defender in Van Marwijk’s squad this summer, the former Aston Villa player will most likely occupy the bench, but if called upon he can cover both the left back position or a centre back position. 13)Ron Vlaar – The Feyenoord centre back will most likely make up numbers this summer; however due to form and injury concerns over Joris Mathijsen, Vlaar may well get called upon. The 27 year old has impressed in the past, so he definitely is an excellent option to have. 15)Jetro Willems – At only 18 years of age, highly rated Jetro Willems will be the youngest player at Euro 2012. Already capped by the Holland national side, Willems is expected to start the tournament at left-back, a position which has been occupied by some Dutch greats, such as Giovanni Van Bronckhorst and Frank De Boer. There is a long way to go in the career of Jetro Willems, but great things are expected of this fine young talent. 21)Khalid Boulahrouz – With just 35 caps to his name, Boulahrouz brings a wealth of experience to the Holland side. At the age of 30, Boulahrouz has top class experience for a number of high profile European sides, including Chelsea and Hamburg. Boulahrouz will more than likely be situated on the bench as back-up for the highly rated Gregory Van Der Wiel. 6)Mark Van Bommel – Dutch captain Mark Van Bommel, could well be participating in his last European Championships this year. At the age of 35, the PSV Eindhoven defensive midfielder is coming to an end of what has been an illustrious career. Van Bommel will want to part on good terms in what will most likely be his final European Championships, and after the disappointment of losing out in the 2010 World Cup final, Van Bommel will want to go out on high and lift the Euro 2012 trophy. 8)Nigel De Jong – With a Premier League winners medal to his name this year, the tough tackling Nigel De Jong is coming into Euro 2012 in good form. The 27 year old may well play a big part in Holland’s quest to be crowned European Champions, as a holding midfielder De Jong’s tackling and strength is a key component to Holland’s game. 10)Wesley Sneijder – Sneijder had a struggling campaign at Inter Milan in 2011/2012, with Inter Milan underperforming and only managing to finish 6th in Serie A, Sneijder will have a lot to play for at Euro 2012. Sneijder has immense quality and is capable of turning a match on its head in an instant. Even though his form is patchy, the attacking midfielder will play a major part for Holland in Euro 2012. 14)Stijn Schaars – Schaars gives Holland two options, the 28 year old can cover the midfield or guard a centre back position. Another tough tackling midfielder, Schaars is a warrior; expect to see the odd substitute appearance from him. 17)Kevin Strootman – At only 22 years of age Strootman will be used as back-up to the Dutch midfield. He is an up and coming talent who has a bright future ahead of him, he is definitely a player to watch in the next couple of years. 23)Rafael Van Der Vaart – Van Der Vaart had a comfortable season at Tottenham Hotspur, as he managed to clock up a total of thirteen goals in all competitions. Along with the fellow attacking minded Wesley Sneijder, Rafael Van Der Vaart will play a pivotal role in Holland’s midfield. 11)Arjen Robben – Arjen Robben is a player who just keeps on improving, now at 28 years of age the winger has had some impressive seasons with Bayern Munich. Robben can pose a threat from either flank and can produce some excellent match winning moments. 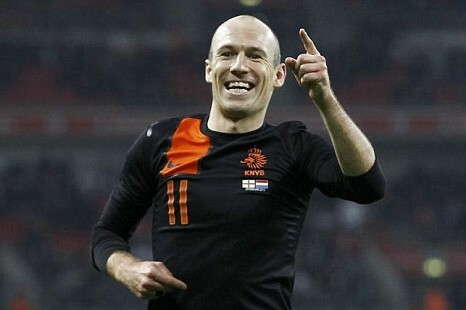 Robben will be a danger at Euro 2012; opposition defences have to be wary of the quality he possesses. 19)Luciano Narsingh – Not many people will know Luciano Narsingh, a young 21 year old winger who currently plys his trade at Dutch side Heerenveen. Great things are expected of Narsingh, who has showed his immense quality with Heerenveen, with some excellent attacking performances, his speed is a danger while he has a great record of assisting goals. This kid is special, and is definitely a one to watch if called upon at this year’s European Championships. 20)Ibrahim Afellay – Afellay has had a frustrated time with his club side Barcelona, limited game time could of well affected his chances of making this Euro 2012 squad; however instead of calling up Eljero Elia or Ryan Babel, Van Marwijk chose the Barcelona winger. Afellay is a very skillful player with bags of ability, don’t expect him to make an impact at Euro 2012, but in a couple of years’ time the 26 year old may well be a key figure in the Holland side. 7)Dirk Kuyt – Coming in from the right flank, Dirk Kuyt is always a handful for opposition defences. Kuyt has a crafty knack of scoring vital goals in games; expect to see him poach a couple of goals in Euro 2012. 9)Klass-Jan Huntelaar – Huntelaar has been on fire for Holland in recent years, the 28 year old has a fantastic goalscoring record for his country. Scoring an incredible twelve goals in qualifying including a hat-trick against San Marino, Huntelaar will be a danger throughout Euro 2012, with the goalscoring touch he has shown he is a brilliant bet to claim the golden boot this summer. 16)Robin Van Persie – Van Persie has been in scintillating form for his club side Arsenal, over the past year the striker has been in the best form of his life. If played in the right position, Van Persie could play a major part in Holland’s success this summer. In the past the 28 year old hasn’t performed to the best of his ability for his country, but with his confidence levels sky high, Van Persie could have a fantastic Euro 2012 campaign. 18)Luuk De Jong – No relation to midfielder Nigel De Jong, striker Luuk De Jong will be used as back-up at Euro 2012. Another promising talent in the Dutch ranks, football fans will be seeing a lot more of this prospect in years to come.